Why, when we bump into an English person on the street, do they apologise for our mistake? In this hilarious ethnography, Kate Fox describes a litany of English customs and rituals that continually puzzle foreigners and the English alike. 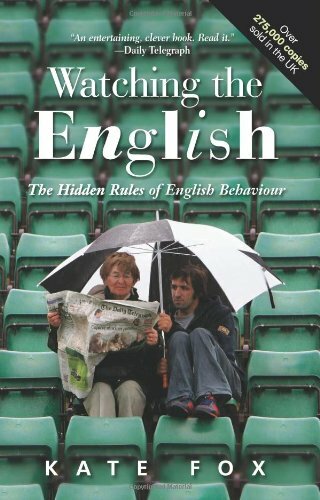 Based on over a decade of research, this book explains the cultural bases of curious English behaviours, such as their obsession with the weather, their extraordinary talent for queueing, why they invented so many games, and how their social class system is maintained. Unlike other social commentators who bemoan the loss of culture, Fox argues that "I am convinced that there is such a thing as Englishness, and that reports of its demise have been greatly exaggerated." Fox used a rather unorthodox range of research methods in order to get to the heart of what it means to be English. Apart from deliberately bumping into people to see what they did, Fox regularly had to steel her nerves to break the golden rule of not talking to strangers in public. She eavesdropped in on pub conversations and bothered people working in their front yards, all in the name of research. And she did it very well: this book is a tremendously enlightening account of what constitutes a core English cultural identity. In fact, this book has been so successful that tourists travelling to the UK won’t leave their hotel rooms without it, referring to it simply as "the book." Fox has had letters from readers thanking her for saving their relationships: what one young man thought was his girlfriend's insanity turned out to just be typical English behaviour. And one American girl, meeting her English boyfriend's high-class parents for the first time, won their approval by eating her peas the ‘proper’ way – squashing them on the back of her fork. "Look, she's one of us!," they exclaimed. Watching the English is great for a laugh. But even better, it is a fantastic lesson in deciphering culture – not just of the English, but anyone's. I highly recommend it for both your own personal amusement and as a tool to reflect upon the world we live in.